we hope you are doing well and this year will be successfull for you. As the year is slowly coming to its end, we suppose you are fully busy with finishing your interesting projects on schedule. We would like to bring your kind attention towards the latest development in our ATENA software, which we strive to continuously develop in order to bring the latest achievements in the numerical modeling of reinforced concrete to your desk. We would also like share our success stories with you because they are written by our users. By knowing their own ATENA experience, we can analyze what we have done well and what should be improved. To meet our users' needs, we regularly organize our ATENA seminar for our users to get familiar with our software's capabilities. We wish you pleasant reading and we look forward to introducing you any further improvements in ATENA in the upcoming year. Improved visualization of vectors and tensorial quantities in ATENA supports new options for user adjustments so that beautiful as well as instructive figures can be created to show for instance the stress flow inside the structure. ATENA version 5.7 will be released this fall. It contains important improvements to the various features introduced in the previous years. These improvements were triggered by the feedback of our users and clients. 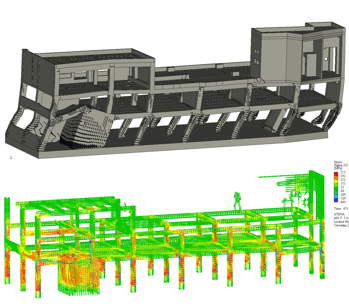 ATENA software is becoming the premier solution for checking the design or assessment of large and safety critical structures. It is therefore often useful to develop large scale complex models involving various element types: - 1D/3D beam elements – 2D/3D shell elements – 2D/3D solid elements. ATENA supports standard 1D beam and 2D shell elements. In addition, it includes special 3D beam as well as shell elements, with only displacement degrees of freedom. This simplifies the development of complex large scale models, where it is useful to combine beam and shell elements with solid elements. Beam and shell elements can be effectively used in areas with dominantly bending behavior, while critical shear dominated areas can be modeled by solid elements. Based on the feedback of ATENA users as well as our own experience of using ATENA in large scale analysis of tall buildings, we have improved the speed of analysis and namely postprocessing almost 100 times compared to version 5.6. 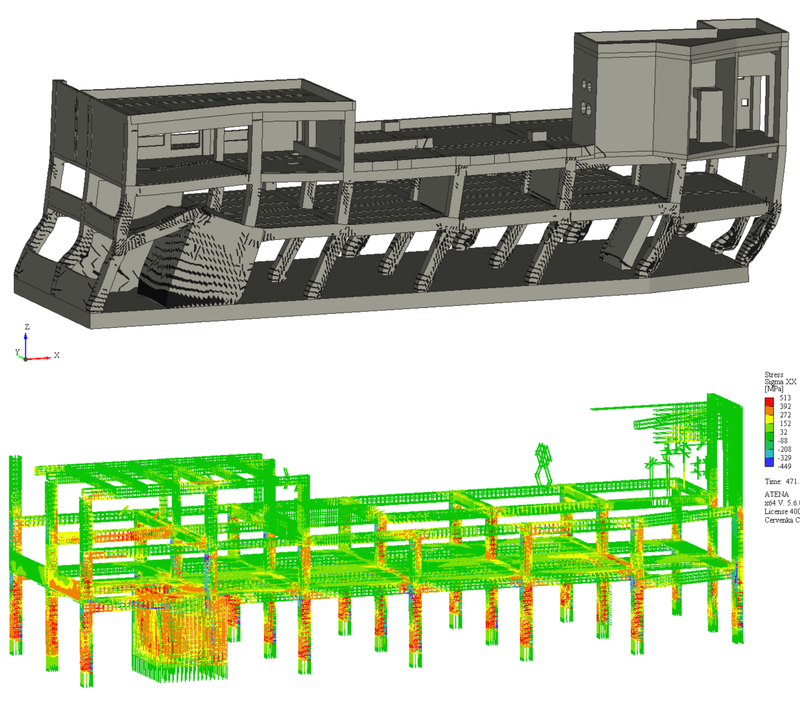 Such large models are demonstrated in the figures in this newsletter, which shows results from performance based design of a multistorey buildings supported by nonlinear analysis. Alkali-silica reaction (ASR) is a reaction in concrete between alkali hydroxides and reactive siliceous aggregates. Results from a pushover analysis of a reinforced concrete building, top - deformed shape and crack pattern, bottom - stresses in the main reinforcement. 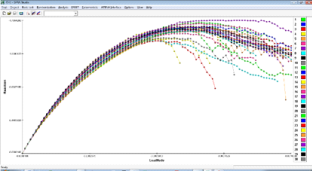 ATENA modeling of pushover analysis of a high rise building. Left bottom window shows calculated crack widths and crack pattern. Right window shows the deformed shape with the principal compressive stress in concrete. This process causes the development of expansion strain in concrete, which may cause secondary cracking and can significantly reduce the concrete strength. 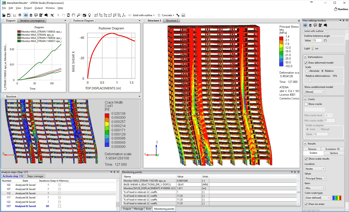 This new material is part of our ongoing effort to provide engineers with an efficient tool to evaluate the durability of reinforced concrete structures. ATENA models now cover the most important aspects of durability of reinforced concrete structures such as chloride and carbonation process, reinforcement corrosion and ASR. The durability features are all available now in the new version 5.7, and they have been developed during a research project DURACERV funded by Czech Technological Agency under the project #TA04031458. ATENA Studio has by now become the most popular software in the ATENA simulation system. 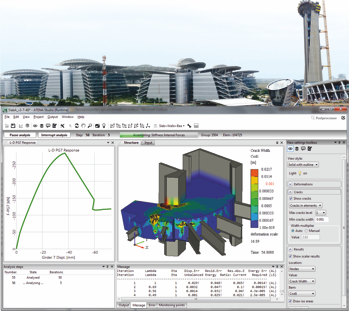 It allows runtime visualization of the analysis process as well as full post-processing capabilities even while the analysis is still running and the iterative process is not yet completed. This very useful insight into the iterative process helps to discover any modeling errors and gives useful hints how to eliminate any divergence problems. This program has been further improved in the version 5.7. The latest version of Microplane M7 model from Prof. Zdenek Bazant and Prof. Ferhun Caner has been implemented to improve the behavior of M7 material model for the modeling of brittle materials such as concrete, rock or masonry. 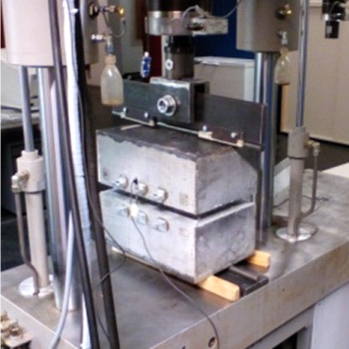 Improvements in the tensile fatigue model that enables to consider the fatigue damage in concrete material in high cycle fatigue. Photo: Tata Consultancy Services Campus Chennai, below ATENA analysis of the RC slab on top of the campus tower. ATENA in the cloud. 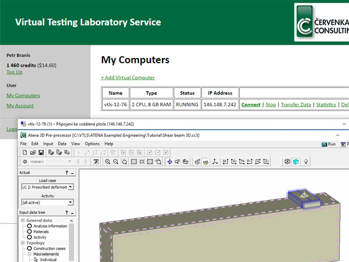 Our new product, the Virtual Testing Laboratory Service, just reached a public BETA version. We would like to invite you to try it. VTLS allows you to use our software ATENA and other tools on cloud based computers. These are created instantly, with all needed software pre-installed. Data can be uploaded/downloaded via this web application. To connect cloud computers created via VTLS you will need some RDP client software. Computers can be operated from any operating systems including mobile platforms iOS and Android. Concrete Hinges (Fig.1) are used in Bridge columns and in Tunnel linings. In the last years concrete hinges gained an increasing interest in monolithic construction, because they are economic, durable and ecological. Current design standards for concrete hinges are based on the guidelines of Leonhardt and Reimann. Nowadays design standards require a semiprobabilistic safety-concept for the Service-Limit-States as well as for the Ultimate-Limit-States. Leonhardt’s guidelines focus more on the Service-Limit-States, and therefore TU-Wien tested several concrete hinges up to their bearing capacity to derive new, substantive design standards. The Institute for Mechanics of Materials and Structures used an external micro-mechanical approach developed by Hlobil et al. for editing the input parameters. ATENA Science is used to model concrete under high triaxial compression [Kalliauer2018ActaMechanica] using the Menétrey-William-failure-surface, which was later improved by Červenka. Fig.2: Stresses all three directions (left: loading direction, middle: horizontal direction, right: thickness direction). A stress ratio of approximately 1:0.5:0.3 (Fig. 2) occurs on the compressive side of the hinge [Kalliauer2018ActaMechanica], leading to a compressive strength of two times the uniaxial compressive strength [Kalliauer2018ActaMechanica]. Also this triaxial stress path leads to a glancing intersection with the failure-meridian [Kalliauer2018ActaMechanica], ATENA Studio can predict the bearing capacity within the experimental scattering without any fitting parameters. The Master thesis of Kalliauer includes a more detailed analysis, such as (a) parameter identification (Fig.3), including the influence on stresses and strains as well as on the bearing capacity, (b) convergence studies, including mesh dependency, (c) influence on different material models, (d) stress distributions in the cross section, (e) dependency of front-side-notches and (f) a statistical sensitivity Analyses carried out in SARA Studio (Fig. 4). The Institute for Mechanics of Materials and Structures want to thank the ATENA hotline support for having answered all the questions. Fig.3: Dependence of the fracture Energy an the plastic strains (left: low fracture energy; right: high fracture energy). 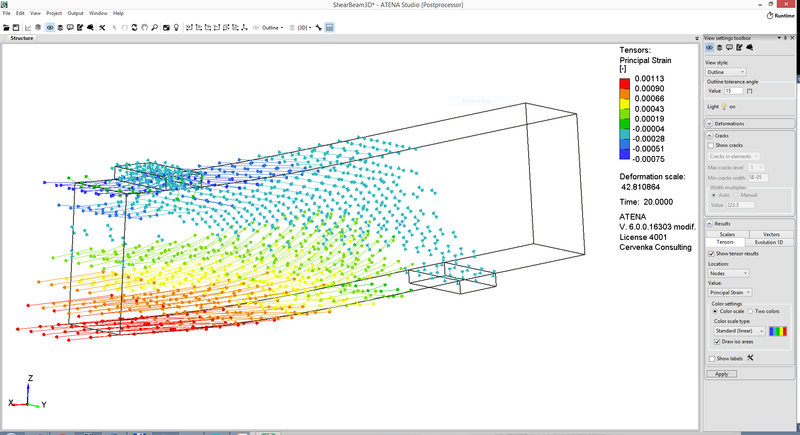 Fig.4: Stochastic Analysis in Sara Studio for the bearing capacity. we would like to invite you to our ATENA Advanced User Seminar 2019. 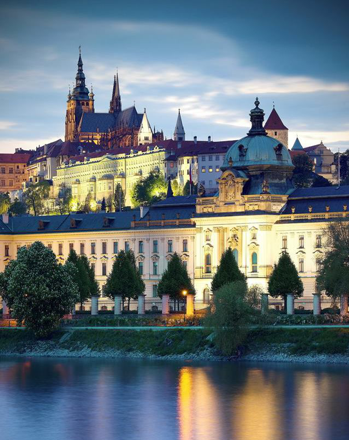 The seminar will take place in Prague, the Czech Republic on February 20-22 in Czech language and June 12-14, 2019 in English language. Overview of new ATENA version 5.6. Modeling contact problems in ATENA. Modeling strengthening of reinforced concrete structures. Modeling of construction process in ATENA for bridges and tunnels. Modeling of fiber-reinforced concrete structures. CERVENKA, J., CERVENKA, V., LASERNA. S.: On Crack Band Model in Finite Element Analysis of Concrete Fracture in Engineering Practice, Engineering Fracture Mechanics, Volume 197, 2018, Pages 27-47, ISSN 0013-7944. You are receiving this email because is signed up to receive newsletters from Cervenka Consulting.